Also known as: Mallala Primitive Methodist Chapel. Known now as Mallala Methodist Church also Mallala Uniting Church. The huge tract of land had been taken up by Phillip Butler in 1842 under occupational license and took in most of the land that we now know as the Hundred of Grace. In 1857 he purchased the land which was known as Mallala Station. Two miles west of Mallala in an area known as Feltwell, another Primitive Methodist Chapel was built with the cemetery adjacent. The chapel was also used as a school from 1869 (may have been earlier) to 1879 when a public school opened in Mallala. The Feltwell Church building was demolished in 1906. A third Primitive Methodist Church was built in the township of Mallala in 1874 to accommodate the needs of the people living in or near the town, as the Feltwell Chapel was always overcrowded. The new church was opened on Nov 18th 1874 by Rev. J. Goodwin. Church Union between the Wesleyans, Bible Christians and the Primitive Methodists occurred in 1900. 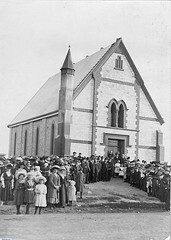 In 1908 the Mallala Methodist Church Trust gave the trustees permission to build a new church in Mallala township adjacent to the first for a cost of 650 pounds. The head master of the Mallala Public School Mr. Thomas Nevins gave the money to build one spire and Mr. Bartlett gave the church bell. The foundation stone was laid by the Govenor Sir Samuel Bart Way. The 9 ft long central timber pews cost 2 pounds each and the shorter side ones 1 pound 4 shillings each. A vestry was added to the rear of this building in 1962. 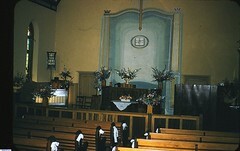 1974 saw a big celebration for the centenary of the Methodist Church in the town of Mallala. In 1978, the protestant denominations of Methodist, Presbyterian and Congregational amalgamated and the Uniting Church of Australia was officially born. June 28th. 2009 marked the celebration for the centenary of the "new' Methodist Church in Mallala. On December 30th 2018 the final service for the Mallala Uniting Church was held. It is now to be known as the "Journey Uniting Church at Mallala." Do you remember Mallala Methodist/Uniting Church ? Then Join up and add your memory here.